Definition - What does Adho Mukha Vrksasana mean? Adho mukha vrksasana is one of the most challenging balancing asanas in yoga. This name is derived from the Sanskrit adho, meaning "downward," mukha, meaning "facing," and vrksasana, meaning "tree pose." 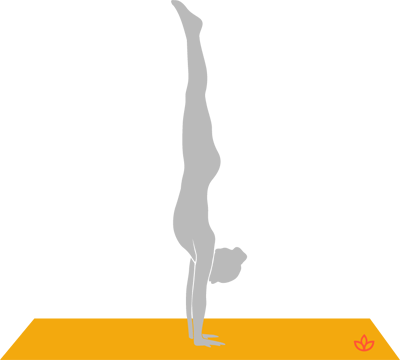 It is named as such because it is an inversion of tree pose. Rather than balancing on the feet and lifting the arms to the sky, the practitioner balances on the hands and lifts the feet. To perform adho mukha vrksasana, the practitioner should begin in adho mukha svanasana (downward-facing dog pose). Walk toward the hands until the upper body is nearly vertical, then kick the legs off the floor to lift them toward the ceiling. The torso and tailbone extend upward, with the arms and legs strong, so that the body balances firmly on the hands. Adho mukha vrksasana is commonly referred to as handstand in English. Practicing adho mukha vrksasana improves balance and circulation, promotes digestion, aids in heart health, and strengthens the spine, shoulders, hands, wrists and bones. Adho mukha vrksasana also activates sahasrara (crown chakra), located on top of the head. Energizing the sahasrara promotes awareness. It is considered the seat of enlightenment and can make one spiritually connected with the Universe.